‘The X Factor’, it’s fair to say, is a show with which I’ve had a notoriously on again-off again love affair. Much like Ross and Rachel, only without the girl from the copy place which yesterday, I took full responsibility for (and I make no apologies to anyone who doesn’t get that reference). At the start of this year, I’d just seen out my second consecutive autumn and winter’s Saturday night viewing firmly on Team Strictly over on the other side. Then, this spring, a couple of things happened in quick succession which made me the most excited I’ve been for a new series of the show since the end of 2011. Firstly, my favourite fellow Essex lad done good, Mr Olly Murs and his TV wife (not to mention last year’s Strictly champ), the brilliant Caroline Flack were to be the new hosts following long standing anchor Dermot O’Leary’s decision to step down after 8 years on the show, thus reuniting them from their ‘Carolly’ glory days as hosts of its spin off show ‘The Xtra Factor’. And then came the news that notorious irrelevant area and seal clapper Louis Walsh had finally been given the heave-ho from the panel – way after time, but better late than never etc. And then, at the end of June, came the news that in Louis’ now vacant place (and Mel B’s from last year), were Rita Ora (having jumped ship after one series on BBC One’s ‘The Voice’) and Radio 1 breakfast DJ, Nick Grimshaw, or Grimmy as he’s more commonly known. At time of writing, the first two episodes of the new series have now debuted over the Bank Holiday weekend just gone, with much focus and derision being doused on the fact it’s ratings were the lowest for a series opener since series 3 (the series that found Leona Lewis) in 2006. But, taking the cold hard facts out the equation, the excitement and interest prior to this new series starting was – on the whole – largely satisfied for me. There’s been much talk all the way leading up to the start of this series that it wasn’t going to be quite so serious as some of the more recent ones had got. I was quite relieved about this, as this was part of the reason I switched off after the 2012 series. In fact, looking back on my old Tweets during that particular series the other day, I sounded like a man more riled by political injustice in a war torn country than by Louis Walsh bottling out of voting on a sing off decision and taking it to deadlock. Not to mention my unusually large (and, with hindsight, ill advised) support of that series’ eventual winner, James Arthur, I decided that I myself, had in fact become rather wrapped up with treating it exclusively as a singing competition per se. The series that found Leona Lewis, was, in some ways, a bit of a mixed blessing. In the four series immediately after that one, Alexandra Burke, JLS, One Direction, Little Mix and, of course, Olly Murs were all found and all have gone on to enjoy worldwide smashing careers – some more so than others. But it then became an obsession to find the next worldwide sensation at all costs that the show took far too seriously in the years that followed, and which partly resulted in me switching off (except when Olly returned to the live shows to perform his then new singles, of course). So, I’ve made a pact with myself this series: to watch it, but to take it, much like the show’s own new outlook (as evidenced in this hilarious trailer that ITV ran, Cheryl-bots, labcoats and all a month ago), much less seriously than before, and if anyone good comes up that I like, that’s an added bonus. And so far, my new approach to watching it has generated a very happy album on the whole. Case in point: episode one’s very first auditionee, 60 year old Susan, or ‘Techno Susan’ – so dubbed because of a tuneless but undeniably amusing rendition of 2 Unlimited’s ‘No Limit’ she did. It’s the sort of audition I would have derided for getting four yeses three years ago, but one which can you see why it’s been put through. Because it’s an entertainment show at heart. For very different reasons, Philippine based girl group 4th Power – who giggled, then exploded onto the stage with a note perfect and move perfect version of Jessie J and Nicki Minaj’s ‘Bang Bang’ were a hoot – and they are easily going to be ones to watch. Not to say of course, that the launch was without its sad moments – good and bad. Jon Goodey, Olly’s old bandmate in his pre-fame, wedding and club singing days as ‘The Small Town Blaggers’ (which Olly took full responsibility in accepting the naming of), uncomfortably and nervously auditioned on the first episode with covers of George Ezra’s ‘Budapest’ and OneRepublic’s ‘Counting Stars’. He was met with four no’s that were difficult to see him be given but were rightly done. As Rita pointed out, Jon can sing, but would now undoubtedly benefit from a year away to keep gigging and building his confidence up and establishing his own identity as an artist away from being Olly’s former bandmate. After all, Alexandra Burke won the thing on her second tryout – who’s to say Jon couldn’t next year? Teeside mechanic Josh Daniel, who auditioned at the end of the second episode, did leave me a bit wobbly lipped and teary eyed, as he sang Labrinth’s ‘Jealous’ as a tribute to a close friend of his who’d died recently – which of course, had a big effect on Simon Cowell whose own mum had passed away just before auditions began filming in July. Sob stories are only a cliched part of a show such as ‘The X Factor’ if the performance fails to make you forget about all that. And it’s safe to say his audition more than made me forget about it as he focussed on the performance and sung it from his soul. You feel like he’d deliver week after week if he got through to the lives. But what about the new presenting and judging lineup? 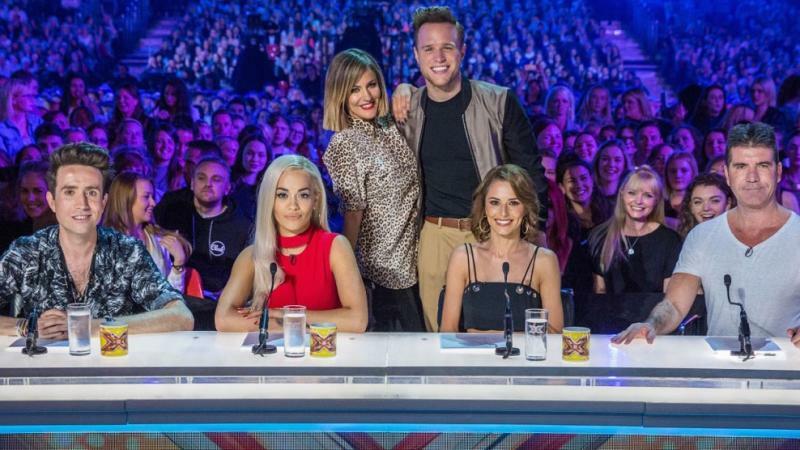 Well, any doubts that Olly and Caroline couldn’t carry their cheeky, light hearted ‘will they won’t they’ banter from ‘The Xtra Factor’ over to the main show are (live shows permitting) largely unfounded. They’re not trying to be Dermot, hell they’re not even trying to be Ant and Dec as some keyboard heroes are trying to suggest. They’ve bought something fresh to the show, something fun that complements it’s suitably lighter new outlook. As was true when they were taken on in 2011, Simon obviously knows good chemistry when he sees it and, like Holly and Phil or Morecambe and Wise, they are just telly double act TV gold. Rita and Grimmy were, I must confess, not my initial first choices for new judges. But the first episodes made me see that they actually do fit in rather well indeed. Even as someone who’s not Grimmy’s biggest fan, I find the criticism leveled at him ‘not being a singer’ baffling, particularly when Louis Walsh spent 11 years on the panel whilst not singing either. Even on the very first series of ‘Popstars’, there wasn’t anyone on the panel who sang. It’s only in recent years we seem to have become obsessed with having all singing and they-who-can-proveth-their-worth panels of judges on music based talent shows. Grimmy brings a bit of the ‘home viewer’ feel to the panel and its a new element that – so far – works. Even Simon himself seems a lot more lighter and relaxed on this series. Of course, he’ll always have that element of wanting to find the next big thing and pound signs flashing in his eyes when he finds a golden auditionee, that’s just his nature, and to argue with it is to miss the point entirely. But it doesn’t seem like – and maybe this is because of his recently becoming a dad – the desire for the next Leona or 1D is as all consuming as it has been in other series. 11 years in and 12 series down the line, he has the air of a man who has seen it all and done it all, and who is now quite happy to go with the flow. Of course, it’s hard to tell what a whole series is going to be like just on the first two audition episodes alone. For all I know, I may have given up in an angry Tweet vented paddy by mid-November or just be solely watching for Olly and Caroline, as was the case in 2012. But the signs so far are extremely promising and, though much may be made of those who’ve now switched off, if I’ve come back to it and given it another chance with an open mind after two years on the other side, that can surely only be a good thing and hopefully I’m not the only one. ‘The X Factor’ is, for me, feel good weekend viewing once again. ‘The X Factor’ audition episodes continue this Saturday at 8.15pm on ITV and on AXS TV in the US. The first two episodes are available for UK viewers to watch now on ITV Player. ‹ Previous#26in26 – 26 songs from the last 26 years, chosen by you.